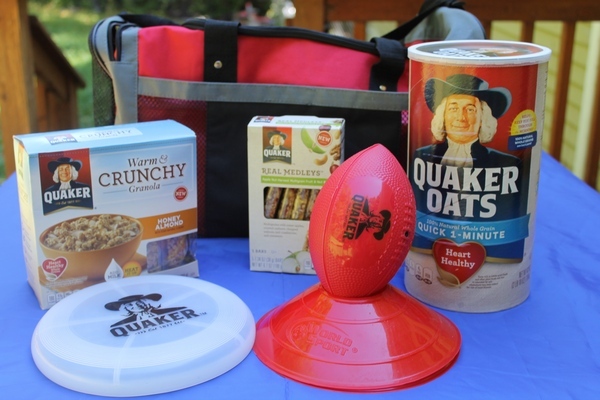 Quaker asked me to talk about their fantastic partnership with Fuel Up to Play 60 and the NFL. All opinions are my own. Anyone who knows me knows I’m incredibly vocal about giving kids time to play. Ever since my son was in kindergarten, I’ve been a very loud advocate for more recess (I have yet to win, but that doesn’t stop me from trying!). I never had a problem getting Jacob active when he was little. As he gets older, though, his passions run more towards video games and other activities in the house. Oddly, he often gets more exercise playing games than he does running around, since he never sits still while playing. Still, I want him to get out and be a kid! This fall, just in time for football season, Quaker has teamed up with Fuel Up to Play 60 and the NFL to create the For the Love of Play campaign. This fabulous campaign has two goals: to fuel up healthy families and get them active for 60 minutes every day, be it at home, in school or anywhere else. Unfortunately, Jacob only gets less than 15 minutes of recess every day at school, so he has to get the majority of his active time at home. 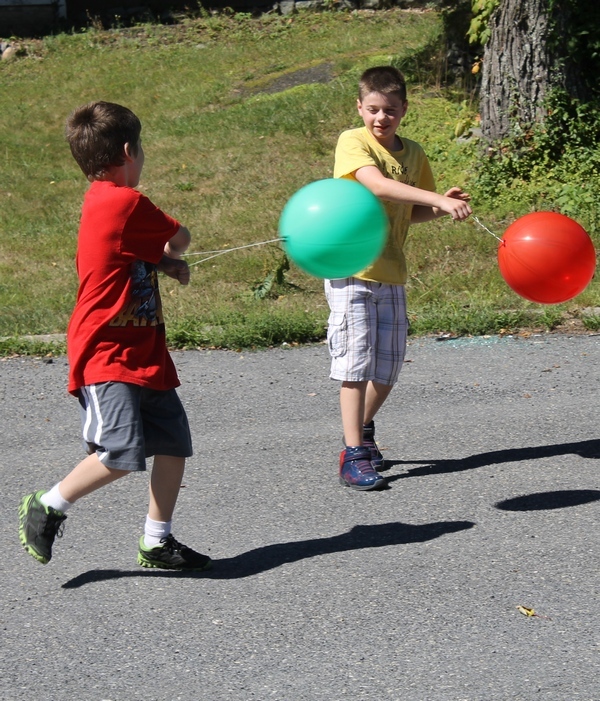 We supplied the boys with punching balloons (I picked up a bag for $1). I find that giving Jacob something totally silly and simple inspires more active play time than actually trying to structure an activity. Check out how much fun they had beating each other up with them! I also brought along Jacob’s scooters, since Sal has a nice big lot in front of his place. 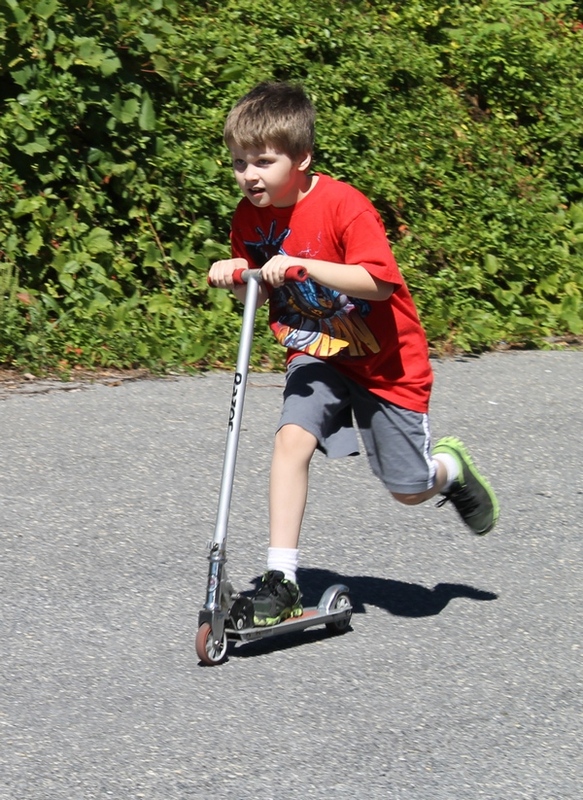 Jacob never did get into bike riding, but both he and Logan love racing around on scooters! Once they were outside, they didn’t even want to come back in for dinner! So next time your kids say they’re too tired, too bored, too whatever to play outside, just kick them out! I bet they’ll be having fun in no time! Now through December 1, 2014, visit QuakerMakethePlay.com to share your unique way that your family plays together for a chance to win! The grand prize? A “Day of Play” in your hometown with Indianapolis Colts Quarterback Andrew Luck. Luck is teaming up with Quaker for the third year in a row to help encourage families to eat healthy and stay active. Plus, there are daily giveaways for $50 NFLShop.com online gift cards. After you enter, join the conversation and share your tips for staying active with your social networks. Use the hashtag #QuakerPlayMaker to follow along. Total giveaway value is approximately $46. Giveaway is open to US residents age 18+ and ends on October 1st. Quaker is providing the prizes for this program at no cost to me. This program is not administered or sponsored by Quaker or its affiliates, but solely by Pretty Opinionated. We walk to the playground and the park everyday! we visit the park on weekends with my grandsons and daughter, go sledding in the winter months, go on nature walks in the summer months, and also my daughter and I like to walk around trying to find buried treasure with her metal detector. finally got the courage to go ahead and give you a shout out from New Caney Tx! My family plays soccer and go hiking together a lot. Someone around here always has a ball in hand ready to play. We make an obstacle course in the back yard with different stations like jump in the wading pool,jump rope ten times without missing,make a basket in the bucket with a nerf ball,etc. and who ever makes it to the end first is the winner. My boys love to play on the trampoline. They love when an adult gets on with them and plays “popcorn” with them. We enjoy hiking together in our state parks. We enjoy walking our dog together as a family. We walk around the neighborhood mostly, but my kids also ride their bikes. We love going to the park with our dog and throwing frisbees back and forth! In the past we have swam a lot. Now my sons love to hike and do outdoor things. We try to do walks and workouts. We like to take walks and work together out in the yard. We keep active by being busy doing a variety of things; yard work, gardening; housework, workout, etc. We stay active by walking everywhere we need to go mostly and going to the mall to walk around over an hour. We walk our dogs and work out together. We like to play with the dogs and we like to play soccer in the back yard. I’m not very good at it, but it gives the kids a good laugh. We go on family camping trips. We enjoy playing disc golf. Its cheap, every age can play and we love being outdoors. We play soccer with three goals (one for each boy) in the field by our house. We play board games, soccer, bowling or new activities! 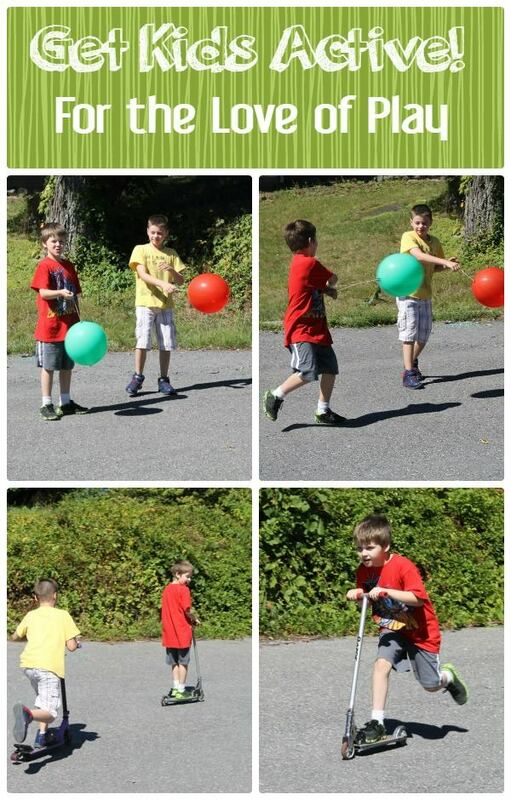 We play a lot tag with the kids in the yard as well as go on bike rides together! We love hiking! And my kids both love going hunting with my hubs, which is a ton of walking through woods and trails! Dirtbikes are also a pretty good workout without feeling like you are working out!